Adding a swimming pool to your backyard is a big investment, so make sure it is designed with the utmost beauty and functionality by building one of our stylish pool deck plans into the construction and design of your backyard pool. 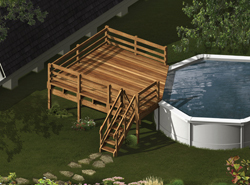 Choose from several styles that are best suited for above ground pools. Adding a deck will expand the outdoor living space around your pool whether you choose to relax or entertain all throughout the summer months. Our collection of pool deck plans includes many styles and sizes perfect for any above ground pool design. We offer detailed drawings that allow the buyer to visualize the look of the entire finished project, right down to the smallest detail. With a wide variety of plans, we are sure that you will find the perfect do-it-yourself project to fit your needs and style.